Eastern redcedar is a native tree that has long been used in windbreaks, shelterbelts, and conservation plantings across the Great Plains. Due to lack of management and naturally-occurring wildfires, it has rapidly spread into grasslands and riparian forests. Redcedar should be used with caution and planted only where needed for quick sheltering or where little else will grow. Management plans/practices should be in place prior to planting. This species has a wide distribution and is found on many types of soil ranging from acid sands to those derived from limestone. It does best on dry soils in full sunlight but is tolerant of both wet and salty soils. 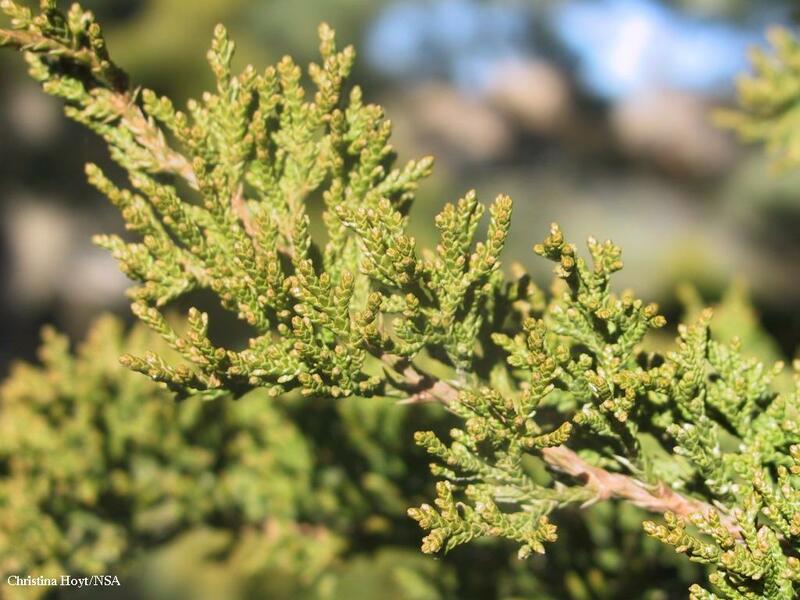 Redcedar grows faster than most other junipers and is moderately long-lived. Red cedars are often used as ornamentals or as shade trees and, becoming quite attractive as they mature and reveal their shredded bark. Old farmsteads and cemeteries often include grand old redcedars. Suitable to plant throughout the state. Plans for long-term management of new seedling growth must be developed. Redcedar can take on many forms but it is typically pyramidal tree becoming rounder in age. Fruits pale-blue with whitish bloom, fleshy ‘berries’ (cones), 1/4 inch diameter, ripening the first season with 1 to 2 seeds in each cone; flowers small, cone-like on end of short twigs, male and female borne on separate plants. Green to gray-green scale-like leaves are awl-shaped and sharp-pointed and often take on a bronze color in winter. The reddish-brown bark becomes shreddy with age. Red cedar and other junipers are important to wildlife throughout the country. Winter food and protection is particularly important for pheasant, mule deer, and whitetail deer. Their twigs and foliage are eaten extensively by hoofed browsers, but the chief attraction to wildlife is the bluish-black berry-like fruit. The cedar waxwing is one of the principal users of red cedar berries, but numerous other birds and mammals, both large and small, make these fruits an important part of their diet. In addition to their wildlife food value, cedars provide important protective and nesting cover. Chipping sparrows, robins, song sparrows, and mockingbirds use these trees as one of their favorite nesting sites. Juncos, myrtle warblers, sparrows of various kinds, and other birds use the dense foliage as roosting cover. In winter, their dense protective shelter is especially valuable. Some redcedar is harvested for saw logs and fence posts. Shavings can be used for livestock and pet bedding. Studies are underway analyzing redcedar biochar as a soil amendment (improving profile and water capture, retention) and a feed additive for cattle (reducing methane emissions). Changes in land management over several decades allowed eastern redcedar to escape its typical habitat and move rapidly into grasslands and riparian forests. The tree still possesses benefits for multi-row or single-row windbreak plantings. However, landowners must plan to actively manage new seedling growth on their property for the life of the planting. Rocky Mountain Juniper (Juniperus scopulorum). For numerous Native American Tribes, the red cedar tree symbolizes the tree of life and is burned in sweat lodges and in purification rites. The distilled oil of the red cedar has been officially listed as a reagent in the U.S Pharmacopoeia since 1916.